‎I've been remiss in my blogging of late. I haven't been posting regularly, if at all, and our weekly Thematic photofests have devolved into once-in-a-while entries. I'm sorry for the inconsistency. Life got a lot busier, and I plumb ran out of time to do the things I once did to relax.‎ So writing, shooting and just sitting on the deck staring at the clouds have taken a bit of a back seat to the day-to-day rush. But have faith: I'll be back into a normal cadence before long. I just have to find my groove again. Suggestions welcome. For now, here's a smile. Because we can never have enough. I periodically fall into a blogging funk, usually because life gets way too busy. But living life is a good thing! 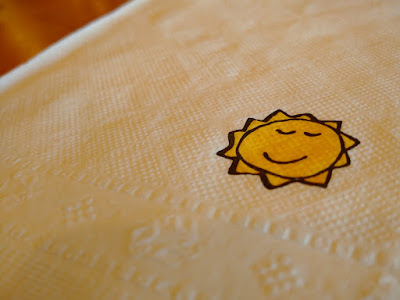 The smile on the napkin made me think of my father. When I was a kid, at dinnertime my father used to lecture us about what was going on at his work (he was a chemical engineer). It usually involved drawing benzene rings on napkins. So I am fond of napkin art. Don't worry. Life is like that! Some things matter and some don't. Ask you daughter what she thinks is important in your life and maybe go from there! Smiling back at you too Carmi. Perhaps we begin next week with photos of "Feeling the Groove" something sure to offer many grooves! Be sure to- Take time for you, in all the craziness of everyday. Carmi: You are one of the most conscientious bloggers around and there's no apology needed. I recall when I had 100 to 300 bloggers on my Blogroll (many of whom you would know). At least three have passed away, but truthfully, most have abandoned blogging altogether for Facebook-only. It's refreshing to see you creating content far beyond what I have been able to produce. Your blogs are always exceptional, my friend!